Being a stay at home mom is stressful. Between the meal prep, never-ending laundry, and a child looking to you for their every need, motherhood is a full-time job all on its own. Mothers are the unsung superheroes of the world, doing their best to keep their little citizens as safe as possible in a world full of the most notorious supervillains: scraped knees, tumbles off the swing set, and broccoli. 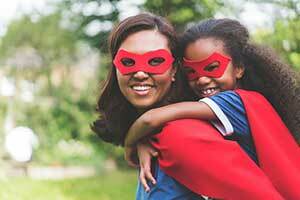 If you’re a stay at home mom, we already think you’re super enough. However, you may be looking to bring in a little extra money for your family. Kaeser and Blair offers flexible work from home jobs for moms who want to make money from the comfort of their homes. A Kaeser & Blair business owner sells promotional products completely on their own schedule, from anywhere that’s convenient for them. There are no contracts, set hours, or days away from the kids. This means that in between nap time and play time, you could be making a little extra money to help fund a much-needed mom-only spa day. K&B’s work from home jobs for moms are an ideal option for mothers who need power over their own schedules and can’t commit to set hours each week. By purchasing our Standard Business Owner Package for only $85, you’ll be on your way to making money for your family. Our work from home jobs for moms are easy to begin and maintain, and offer great earning potential- some part-time workers make up to $20,000 per year! The promotional products industry recently hit $21.5 billion in sales and is expected to increase over the next few years. This means that there’s no uncertainty about entering a field, only to have to quit a few months later because you aren’t profiting. In fact, K&B has been in business in their industry for over 100 years. Your freedom and flexibility are of the upmost importance to us, and our work from home jobs for moms rival all other work from home companies. If you’re a super-mom looking for a profitable way to make money from the comfort of your own home, you’ve come to the right place. Start by requesting our FREE TRIAL LAUNCH PACKAGE, or purchase the Standard Business Owner Package and get started earning immediately. If within 30 days you aren’t satisfied with the results, we’ll refund you the full $85, no questions asked! Purchase it here, and start seeing how much you can make today with our stay at home mom jobs!